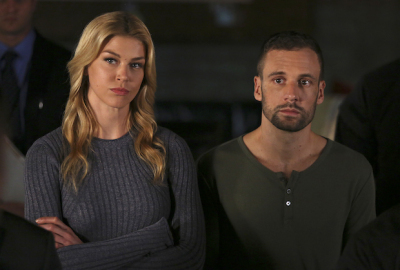 Fans of Bobbi Morse and Lance Hunter (which is basically everyone, right?) were no doubt disappointed when ABC declined to pick up Marvel’s Most Wanted after the duo left Agents of S.H.I.E.L.D. in the third season. We were all glad to see Nick Blood as Hunter appear in one episode of the show’s fifth season, but even though she’s been open to it, we still haven’t seen Hunter’s ex-wife, aka Mockingbird, return as of yet. That sounds pretty emphatic to me! So, Marvel/ABC/showrunners, let’s do this thing. If not in season six (which wrapped production last month according to ScreenRant), then bring back either Bobbi or both of them for sure in season seven, okay? In the interview, Palicki also shared a few tantalizing details about the spinoff that never was. She described the pilot, which never aired, as “actually really, really good” and “a little darker, grittier” than the original series. (After some of the plotlines and stories in the previous two seasons, a network show that’s darker and grittier than SHIELD is hard to imagine in some ways, but we’ll take her word for it!) She also teased that in the midst of constant danger as people tried to hunt down the two ‘most wanted’ mercenaries, Bobbi and Hunter were going to try to get re-married. Aw. Maybe if the two characters do come back in coming season(s), they can at least reference some elements of that idea. Either way, it will depend on Palicki’s availability. As she’s still starring on FOX’s The Orville, the SHIELD team would have to work around her schedule. Let’s hope it can work out! Agents of SHIELD‘s sixth season will premiere this summer on ABC.